Dr. John Carlos addresses the Black Cultural Conference audience, next to the iconic image of his protest at the 1968 Olympics in Mexico City. APS students listen to John Carlos speak on education and activism. 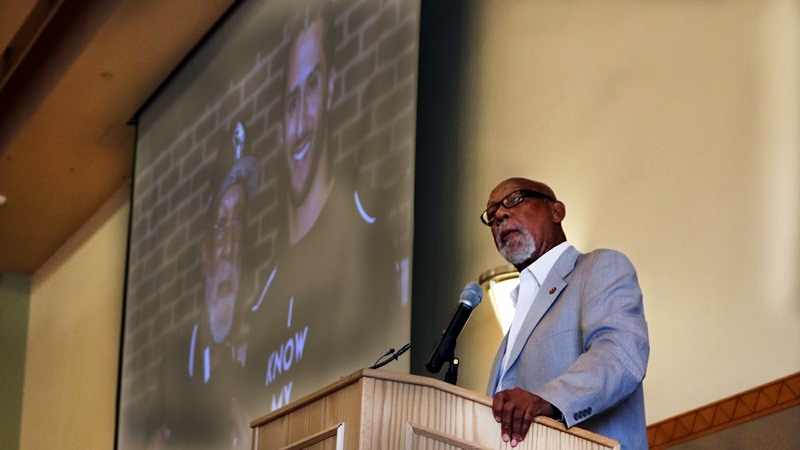 John Carlos addresses the BCC Keynote audience; in the background, an image of himself with athlete and activist Colin Kaepernick. 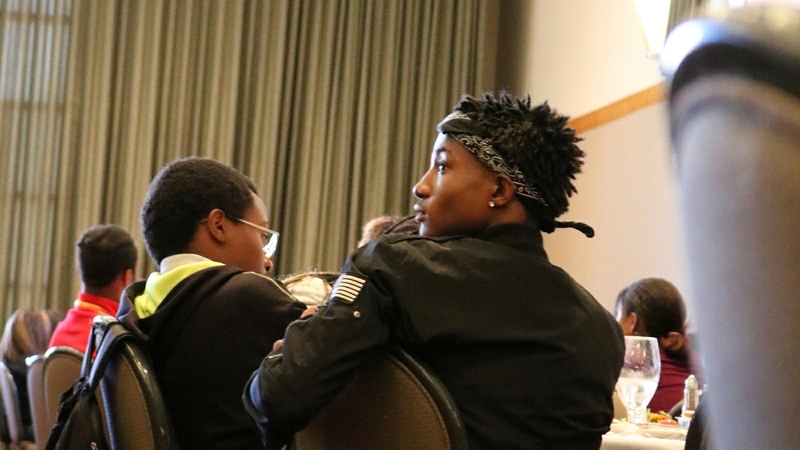 The Black Cultural Conference hosted educators, staff and students from UNM and from the high school classrooms of Albuquerque Public Schools. During his keynote address, Carlos spoke to the audience about the importance of education and the need for strength and persistence among young, tenacious activists. It’s been 50 years since Carlos raised his fist on an international platform, and in that same year the Black Student Union (BSU) came into being at UNM. 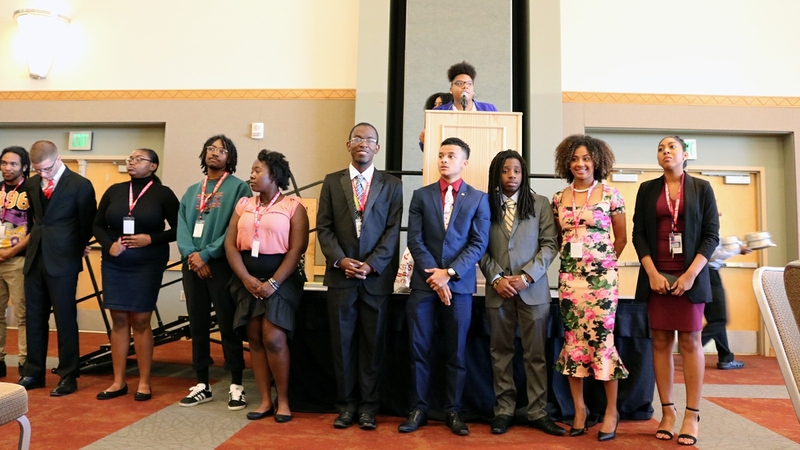 Immediately following Carlos’ keynote address, the current members of UNM’s Black Student Union were recognized, along with the last two living founders of the BSU, Barbara Brown Simmons and Sam Johnson, who were honored as Living Legends. Brandi Stone, advisor to the Black Student Union, reflected on the power of this moment. 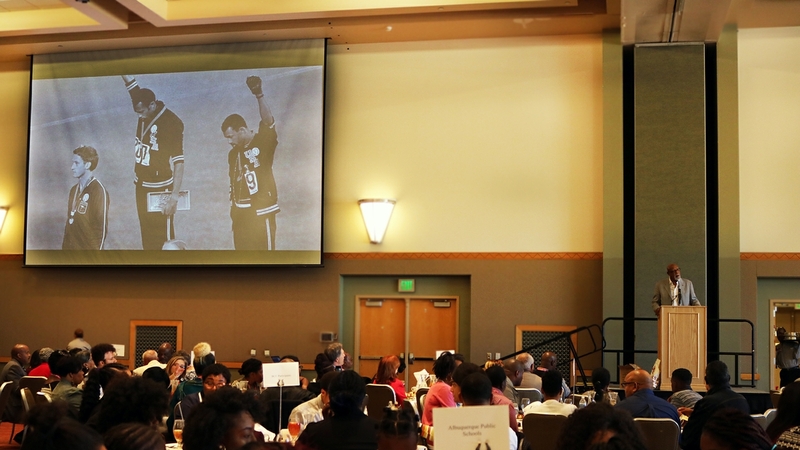 “To sit in a room where we were recognizing Dr. John Carlos, ‘the world's fastest humanitarian,’ while also celebrating the 50-year anniversary of the Black Student Union with the charter members was an exciting and humbling experience,” Stone said. During the keynote, a slideshow of images played behind Carlos, from his days training for the Olympics, to his pivotal stance on the medalists’ platform, to a smiling photo next to fellow athlete and protestor Colin Kaepernick. This series of photos captured the ripple effect of powerful actions, and the critical importance of carrying the torch of progress forward. In a room with Carlos and members of the Black Student Union past and present, Stone says that sense of passing the baton was palpable. Sometimes, to truly capture the feeling of a moment, it takes an image.